Vacation is a time when you can just get away from everything, to spend time by yourself, with friends or that special someone; leaving your home to see something different is always exciting — that is, until you cross paths with someone that makes your life a living hell. 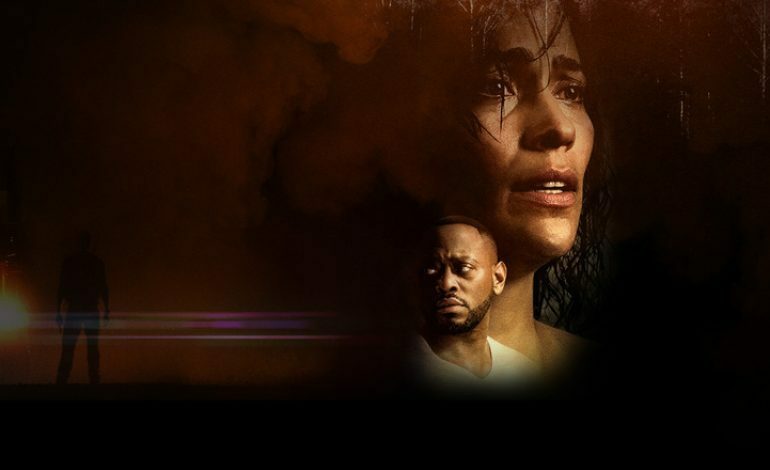 Traffik utilizes that clichéd idea that most thriller/horror fans are well aware of and even goes so far to use the “inspired by true events” disclaimer. I don’t want you to think I’m already slamming Traffik, but one can’t deny the issues that have plagued a promising story that ends up being a pale, boring narrative that doesn’t recognize the point that it’s trying to make. We begin the story with Brea (Paula Patton) and her nice boyfriend John (Omar Epps) who are getting away from Sacramento to have some time together in a house that John rented for Brea as a surprise for her birthday. Brea is a journalist and it’s a much-needed break from her work. Prior to all this, Brea, John, and two of their friends Malia and Darren (Roselyn Sanchez and Laz Alonso) have a dinner party for Brea. Things heat up when John is thinking about proposing and Darren is an obnoxious fool who talks too much. John builds a nice muscle car for Brea as a birthday present and the two are off to the mountains. They stop for gas and encounter some biker guys who accost them as soon as they meet. Writer and director Deon Taylor (Dead Tone) makes a typical horror film, in a bad way. The villains are not noteworthy or the least bit menacing and he writes characters that make dumb decisions. I hardly felt for any of the characters except Brea and John when the horror started to unfold. There are a couple of things I want to mention: there is a cool chase sequence that ends with an injured and pissed off biker, but Brea and John don’t report this to the police and move on as if nothing happened. Plus, why is the movie so slow? It starts out with promise and takes forever to get to the point. Either the villains have a lot of patience or the script isn’t using the effectiveness of its plot to further the story. I can see why Paula Patton was interested in this film (she served as producer), as it features a woman fighting for her life, but the film doesn’t grasp the horror of what it’s going for. Even the ending title cards do nothing to impress, shock or even educate. It feels like a sad excuse for a horror film when using the “inspired by true events” disclaimer. There’s no sense of gravity into the horror that she’s facing. Traffik is too silly to be taken seriously and the plot just drags and drags. The villains aren’t scary at all and the twist can be seen coming way before it happens. Lacking scares and thrills, Traffik fails at embracing the horror of what it’s trying to do. It’s just another standard horror film with some good performances from the main cast, but everything feels more like a B movie that lays on the clichés faster than it took me to write this review. Traffik is an unrealized mess!